Hello and welcome to my Kumho Ecsta AST review. Maintaining a sports car is a pretty expensive task. It’s not just about the sheer price of the thing, but also about the price of all other integral parts. Owners also drive their sports cars like maniacs, which makes things even worse – things break down more quickly if you push them to the limit. This is especially true with tires. High-performance tires are not only more expensive when compared to other types, but sports cars often have bigger rims and wider tires, which pushes the price up even further. Add to that shorter tread life, in no part thanks to the aggressive driving, and you’ll see yourself spending thousands on tires probably every two years. What if I tell you that you can still drive like a maniac and keep your budget (almost) intact? Kumho is almost always the answer to buyers who are fed up with the high prices of premium tires, and their Ecsta AST is specifically made for sports cars and high-performance driving. The price is also much lower than those of premium manufacturers, and the design is really eye-catching. But, does that design translate into excellent handling ability? 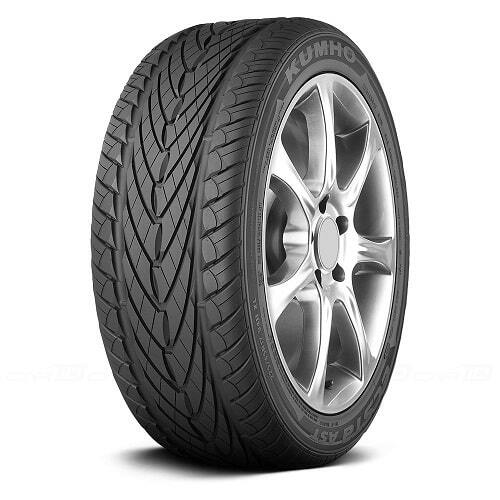 Read on to find out in my review of the Kumho Ecsta AST. 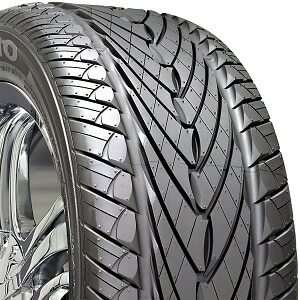 Interestingly, Kumho designed this tire with exotic looks in mind and in this area, they certainly delivered. V-shape tires are favorites with sports car owners – they add dynamic looks and suit the aggressive styling of those cars. For this reason, the Kumho Ecsta AST is very popular with tuners, especially those who want to show off their cars to other people. But, let’s get back to the features of the tire. The Ecsta AST is equipped constructed using high-tensile steel belt and jointless cap ply for reinforced tread area. This helps the tire keep its shape in hard cornering and ultimately, keep the car stable at higher speeds. Lateral grip is covered by the ultra-hard bead filler, while the all-season tread compound improves resistance to water, one very important area to high-performance tires as well. The Kumho Ecsta AST is also equipped with specially-designed jointless high-strength bead wire that minimizes road surface vibration and together with the ultra-hard bead filler, improves ride comfort. The shoulder blocks with a sharp leading edge and a rounded trailing edge prevent wear in heel and toe driving, while also improving traction in rain and snow. One very important aspect for tuners is the rim protector in the lower sidewall, that will protect your precious rims from scratching, abrasions and other types of damage. 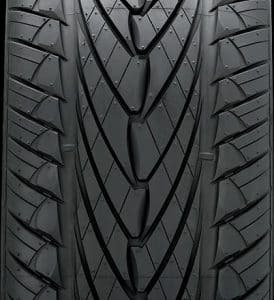 The Ecsta AST is rated by Kumho as a tire that’s excellent in dry and wet weather, with low noise and long tread life. If it achieves all of those things for the price it’s offered, I will be impressed. So, let’s find out if that’s the case! High-performance tires are not the best solution if you want maximum durability and long tread life. The Kumho Ecsta AST certainly falls into that category – you shouldn’t expect performance on the level of touring tires. That said, when compared to other high-performance tires, even those from premium competitors, it’s not bad at all. It is not the best by any means – that accolade probably goes to the Michelin Pilots, but for the price, the Kumho’s are very good as well. And even when they degrade, they don’t lose on the handling abilities and can still provide the driver with responsive handling. While we’re talking about the handling, let me tell you that this tire is good, but not exceptional. Here the price difference when compared to the same Michelin Pilot I’ve already mentioned really shows. Of course, it’s much better than touring or normal all-season tires – the handling is responsive enough for most sports car drivers, but to get the most out of your car, like say on a track, it’s best to shell out more money for premium tires. Braking in dry conditions is excellent though – the stopping distances are short and the car remains controllable. High-performance tires work best in a dry condition, but they must also work in wet conditions. Weather is unpredictable if you didn’t notice by now. I wasn’t expecting a lot from Ecsta AST in the rain, and I didn’t get a lot. It has decent traction and good handling response, but there can be hydroplaning in heavy rain, something I didn’t expect. Overall, it’s a fine showing, but far from what the best high-performance tires offer right now. Even though this is a high-performance tire, Kumho took some measures when designing it so it can provide adequate traction in snow. Well, they mostly succeeded. The thing is, this tire is far from the best solution for dry winter driving, and specifically for snow driving. There are small amounts of traction on offer, but you should only use them if the snow has surprised you – not as a substitution for winter tires. If you live in areas with heavy snow, I suggest going for proper winter tires. Another category where even the mightiest high-performance tire fall to the ground is a comfort. The ride of the Ecsta AST is good enough for a tire of this caliber, but nothing exceptional. Still, this is something that most owners will overlook in this category, especially because sports cars already have very taut suspension setups. The Ecsta AST is also not very quiet – you’ll hear the tire roar at almost any speed. Driving on the highway with a set of these tires can become tiring after an hour, so if you use your car mostly for that kind of driving, I suggest going for proper touring tires, or models like Bridgestone Potenza, Michelin Pilot, and Pirelli P Zero. The Kumho Ecsta AST is a tire that tries to achieve a lot of things, and in reality, it does most of them. The most jarring disadvantage of this tire is the overly loud roar it makes on the highway, but otherwise, it’s a good showing from Kumho here. I will say it again – it will not beat premium high-performance tires, but for drivers with lower expectations, it can be the only tire they need. Thanks for reading and I hope you found this Kumho Ecsta AST review helpful. If you have any questions or comments please feel free to leave them in the comments section below.